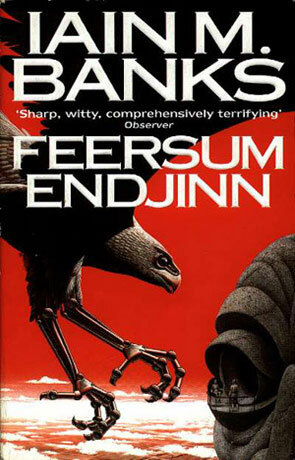 Feersum Endjinn is a science fiction novel by Iain M Banks. I don't really feel that I can do a fair review of this book, as I only read about 3/4 of it. The reason for this is that about a quarter of it is written in a kind of phonetics, that I just couldn't read. I'm not sure why I couldn't read the Bascule parts (Bascule is the storyteller in the phoneticly spelled parts of the book) - maybe it's because I usually read whole words and groups of words at once. I do not read them as sounds but as symbols. Anyway, a lot of people in rec.arts.written.sf like this book and have no problems reading the Bascule parts, so it could work for you. If you don't have any problems reading the phonetic Bascule parts, I will recommend the book on Banks' name alone. Written on 1st November 1999 by TC.